Between the need to relieve themselves and the desire for playtime, dogs can’t escape the great outdoors no matter how cold, icy, and snowy it becomes — even the indoors can become uncomfortable depending upon the conditions. Just like you take extra measures to keep yourself healthy and warm during the winter, your dog needs the same TLC. While a dog owner is already filled with a host of responsibilities, make sure you’re adding a few extra tasks to the list when the temps take a dip. H3N2 is an avian flu virus that adapted to infect dogs — there have also been some cases of infected cats. The virus is different from human seasonal viruses even though there are many similar symptoms, such as a runny nose, eye discharge, fever, lethargy, cough, runny nose and reduced appetite. The tricky part is that not all dogs appear ill while others can get pneumonia and die — though this is rare. Most dogs tend to recover within two-to-three weeks. The virus is contracted through other dogs by coughing and sneezing, so it’s a good idea to keep your pet away from other canines (especially dog parks) during the winter months. There is a test for H3N2, so take your dog to the vet as soon as you see any symptoms develop. Treatment may include antibiotics and additional fluids. From a preventative standpoint, there’s a vaccine available, so talk to your vet to see if that’s a good option for your dog. Don’t be deceived by all that fur. 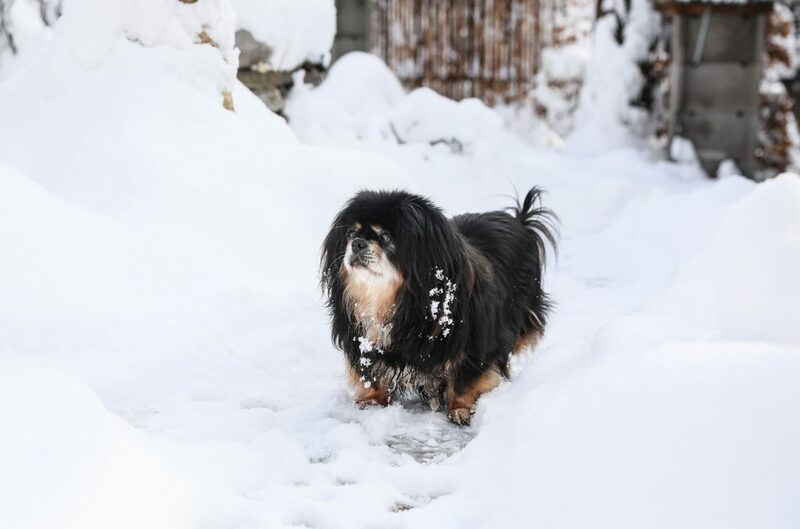 Domestic dogs can’t withstand cold temperatures like you may think, so it’s important that you prepare your pooch for the outdoor climate while making their indoor space more comfortable. Both cats and dogs have slightly higher resting body temperatures than humans, so when it is colder outside make sure they have a blanket in their bed and an area to sleep in the sunlight during the day. Also, be sure to dress your dog in booties and a sweater when taking them outside to potty, because extreme changes in temperature increase risk of illness. Senior dogs tend to have stiff, achy joints in the winter — especially if they already have arthritis — so opt for a heated bed that’s off the floor. Since mobility is an issue, purchase a ramp or dog stairs to assist your pooch with getting to a favorite snooze spot. No matter what, keep your dog moving and watch its weight so that there isn’t additional pressure on the joints. Complacency will only make the pain worse and there’s liable to be strength loss. If you detect you furry friend feeling extreme discomfort, talk to your vet about possibly prescribing a non-steroidal, anti-inflammatory drug. Pay attention when walking your dog because antifreeze spills and certain ice-melting pellets can be deadly if consumed by licking paws or snow. To prevent any risks of outdoor poisoning during the winter months, protective booties for your dog are a great idea. Regardless, educate yourself on the signs of poisoning and contact your vet immediately should you notice a change in breathing, drop in body temperature, increased drinking and urination, vomiting and diarrhea. To prevent dryness, limit baths and protect and hydrate pads and ears with coconut oil or Vaseline — placing a humidifier near its bed can also be helpful. A diet rich in omega-3 and omega-6 essential fatty acids (along with adequate water) can help maintain a lustrous coat, so talk to your vet about making any potential dietary tweaks. If your dog has long fur, keep it trimmed, so it doesn’t pick up ice crystals. Even though you want to keep your pooch warm, avoid placing its bed near a space heater or hot furnace, so it doesn’t become burned. While most of these precautions are common sense, it’s still a good idea to keep a checklist in the cold weather months, so nothing falls to the wayside. Keep a close eye on your dog in case you detect any signs of distress. Call your vet if anything seems off because it’s better safe than sorry.